In Greek myth he was the man who discovered how to make men fly (losing his son Icarus in the process). But where did this myth come from? 3,700 years after their construction, the palaces of the Minoan era in Knossos and other parts of Crete continue to impress. They were imposing, multi-leveled complexes with elaborate layouts, countless passageways and many different spaces: formal reception halls, royal apartments, residences, workshops, religious sanctuaries and subterranean vaults, storerooms and prisons. 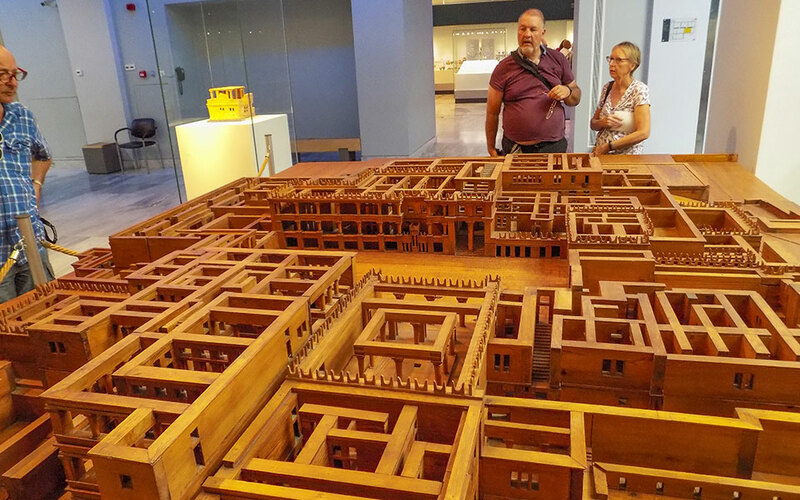 This real-life maze – the Minoan palace with its labyrinthine layout – clearly informed the myth of the Labyrinth. This was the complex underground level said to have existed underneath the palace of King Minos – the mythical first king of Crete for whom the Minoans are named. The Labyrinth was said to consist of countless corridors, unexpected forks, sharp bends and dead ends. Once lost inside the maze, exiting was virtually impossible for anyone who didn’t know their way around. In the center of the Labyrinth lived the Minotaur, the man-eating monster with the body of a man and the head of a bull. 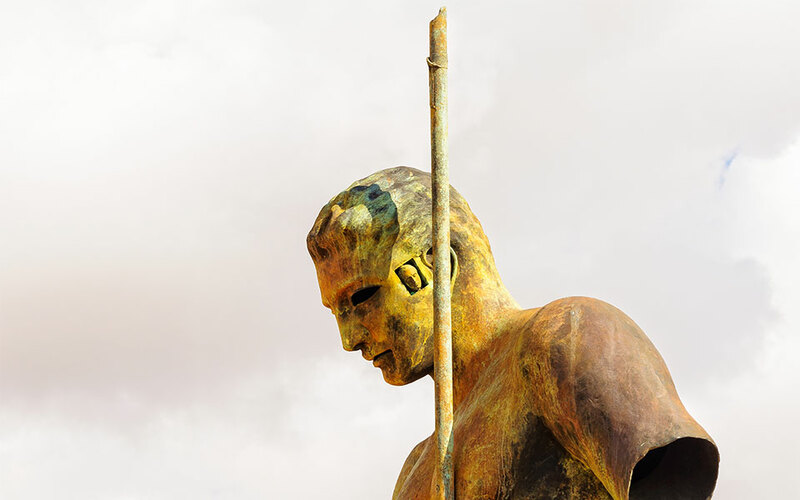 He was ultimately slain by Theseus, a prince of Athens, who was able to navigate his way out of the maze thanks to a reel of string given to him by the Minoan princess Ariadne. 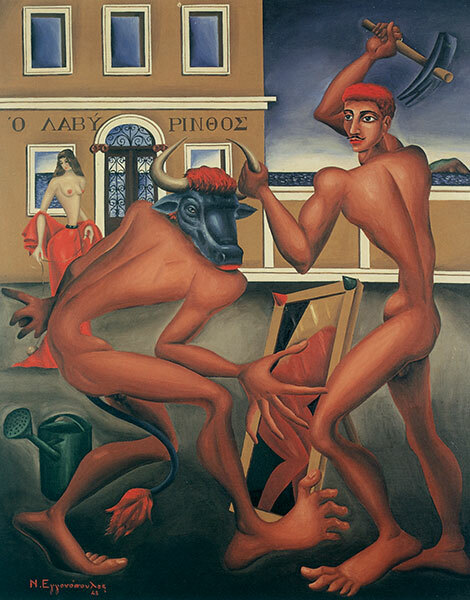 Nikos Engonopoulos, "Theseus and the Minotaur", oil on canvas (1948). We do not know who designed the real-life labyrinth of the Knossos palace. In the myth of the Minotaur however, the mastermind behind it was Daedalus, a legendary inventor and architect said to have built a similar labyrinth in Egypt. Imposing citadels, impressive palaces, monumental constructions, luxurious halls, temples, aqueducts and thermal baths in Crete as well as Egypt and Sicily have all been attributed to his architectural genius. At around the same period, the art of sculpting human forms appears to have developed significantly, with statues acquiring realism and a sense of movement. Daedalus was credited with this too. Indeed it was said that Daedalus’ statues were so lifelike that people would tie them up to ensure that they wouldn’t run off in the night. 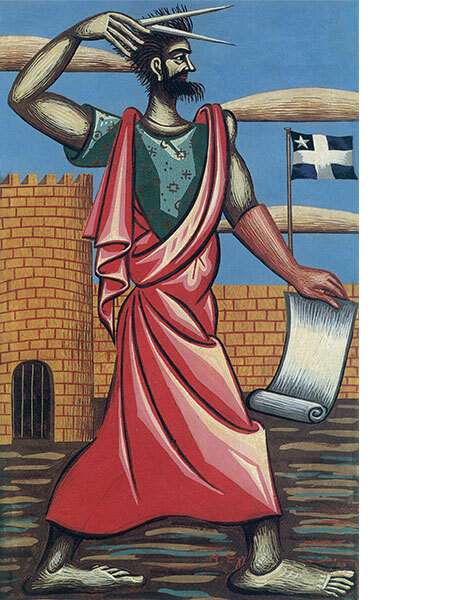 Daedalus is connected to yet more myths which reflect the technological achievements of the Minoan civilization, the first highly developed civilization on European soil. As well as being an architect, he is also described as a master seaman and shipbuilder, a master carpenter and ingenious inventor. One of the practical inventions that Daedalus is credited with is adding sails to boats which, until that point, had been only powered through the use of oars. And that is not by chance – Minos’ Crete was renowned for its powerful fleet, with boats that were unprecedentedly fast and durable. How did Daedalus become connected with the revolutionary technology of ships’ sails? 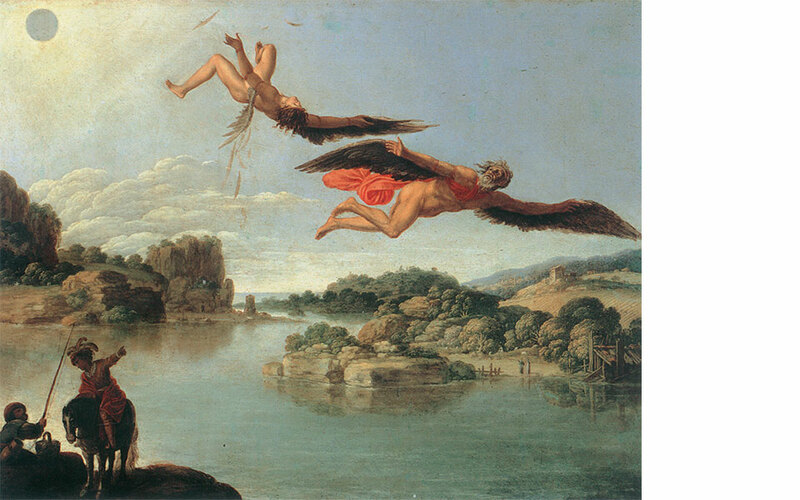 According to the myth, after completing the labyrinth for King Minos, Daedalus decided to leave Crete with his son, Icarus. But Minos did not want to lose his star architect and builder, and so they had to devise a way to escape. In the most well-known version of the story, Daedalus crafted wings from wax and feathers and the pair took flight. But, of course, Icarus got carried away and flew too close to the sun which melted the wax on his wings. They disintegrated and Icarus plummeted into the sea where he was lost. 'Landscape with Fall of Icarus (Paesaggio con caduta di Icaro), by Carlo Saraceni, 1606-1607, 17th Century, oil on copper, National Museum of Capodimonte, Napoli, Italy. In Ovid’s writings which present this version, the construction of the wings is described in a way that recalls how sailing ships are built, while the instructions that Daedalus gives his son about how to fly resemble the principles of sailing. Yet that is not the only version of the story. Others (in particular the ancient historians Diodorus and Pausanias) maintain that Daedalus and Icarus fled Crete by ship and were the first to use sails. In this telling, with a strong wind at their backs and the experienced navigator Daedalus at the helm, the ship flew over the waves, traveling faster than the oar-driven ships King Minos had sent in pursuit could muster. Daedalus and Icarus thus escaped by sea, and all those who saw the ship’s sail disappear over the horizon said that the father and son had developed ‘wings’ and taken flight.